Mites (Acari or Acarina) are the most diverse and abundant of all arachnids, but because of their small size (usually less than a millimeter in length) we rarely see them. The ticks are an exception, in that they are usually big enough to see, especially when they are filled with blood. Red velvet mites are also among the giants of the Acari (to 10 mm), and can often be seen hunting on the ground or on tree trunks. Water mites are rarely more than a few millimeters long, but their bright colours and rapid movement often bring them to our attention. At the smaller end of the mite size range are species like the human follicle mite or the honeybee tracheal mite - small enough to raise a family within a human hair follicle or within a bee's respiratory tube, and too small (ca. 0.1 mm) to see without a microscope. Mites are also among the oldest of all terrestrial animals, with fossils known from the early Devonian, nearly 400 million years ago (Norton et al. 1988, Kethley et al. 1989). Three major lineages are currently recognised: Opilioacariformes, Acariformes and Parasitiformes (Krantz 1978, Johnston 1982, Evans 1992). About 45,000 species of mites have been described - a small fraction (perhaps 5%) of the number of species estimated to be alive today. Mites are truly ubiquitous. They have successfully colonized nearly every known terrestrial, marine, and fresh water habitat including polar and alpine extremes, tropical lowlands and desert barrens, surface and mineral soils to depths of 10 meters, cold and thermal surface springs and subterranean waters with temperatures as high as 50C, all types of streams, ponds and lakes, and sea waters of continental shelves and deep sea trenches to depths of 5000 meters. Some idea of mite abundance and diversity can be gained from analysis of one square meter of mixed temperate hardwood or boreal coniferous litter, which may harbour upwards from one million mites representing 200 species in at least 50 families. Within this complex matrix of decomposing plant matter, mites help to regulate microbial processes directly by feeding on detritus and microbes, and indirectly by predation on other microfauna. 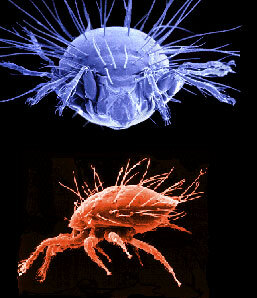 Many mites have complex symbiotic associations with the larger organisms on which they live. Plants, including crops and the canopies of tropical rainforests, are inhabited by myriads of mite species feeding on mosses, ferns, leaves, stems, flowers, fruit, lichens, microbes, other arthropods and each other. Many mites found on agricultural crops are major economic pests (e.g. spider mites) or useful biocontrol agents (e.g. phytoseiid mites) of those pests. Mammals and birds are hosts to innumerable species of parasitic mites (e.g. scabies and mange mites), as are many reptiles and some amphibians. Insects, especially those that build nests, live in semipermanent habitats like decaying wood, or use more ephemeral habitats like bracket fungi and dung, are hosts to a cornucopia of mite commensals, parasites and mutualists. None of these mites exceed a centimeter in length, and the vast majority grow to less than a millimeter, yet they often have a major impact on their hosts. Traditionally, the mites have been treated as a subclass of the Arachnida, and three major lineages have been recognised, though the names used to refer to these groups have varied considerably (Krantz 1978; Johnston 1982; Evans 1992). Here we generally follow the names used in Parker (1982), and consider that three superorders (sensu Evans 1992) of Acari exist. The Opilioacariformes consists of a single order and family (Opilioacarida, Opilioacaridae) with about 20 known species. The Acariformes contains over 300 families and over 30, 000 described species. Two major lineages are recognised, the Sarcoptiformes (Oribatida and Astigmata) and Trombidiformes (Prostigmata). Additionally, eight families of very early derivative acariform mites are lumped into the Endeostigmata, usually considered a suborder of the Prostigmata, but clearly containing taxa that belong to both major acariform lineages. The Parasitiformes consists of three orders: Ixodida, Holothyrida, and Mesostigmata. The Mesostigmata contains in excess of 65 families and 10,000 described species, the other two parasitiform orders each comprise three families. 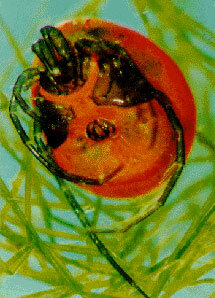 About 850 species of ticks are known, but only about 30 species of holothyrans have been recognised. What then is a mite? Aside from being generally tiny chelicerate arthropods with hexapod larvae, a discrete gnathosoma, and a loss of primary segmentation, mites are difficult to characterise. Lindquist (1984) pointed out that many of the characters used to define mites were present in other chelicerate orders, especially in the Ricinulei. He proposed 11 apomorphic characteristics for the Acari (Table 8, p. 40), but several of these character states are not present in the Parasitiformes and presumably have been secondarily lost. It seems that mites often are most easily recognised by what they are not - other arachnids, rather than by a discrete set of acarine characters. Among acarologists, arguments about monophyly or diphyly of the Acari have yet to be resolved, although currently the monophyleticists seem to be dominant (see Lindquist 1984, Evans 1992). The Parasitiformes and Opilioacariformes are thought to be sister groups, and in turn this taxon (the Anactinotrichida, so named because of the absence in their setae of optically active actinochitin) is considered the sister group of the Acariformes (also called the Actinotrichida). Outside of the acarological community, those interested in chelicerate phylogeny have tended to assume that the Acari were a monophyletic assemblage (e.g. Weygoldt & Paulus 1979, Shulz 1990, Weygoldt 1997). Recently, many acarologists have concluded that mites are closely related to the arachnid order Ricinulei (Lindquist 1984, van der Hammen 1989, Evans 1992). Weygoldt & Paulus (1979) first proposed a sister group relationship between the Ricinulei and the Acari, and named this taxon the Acarinomorpha. Schulz (1990) also supported this relationship, but like Weygoldt and Paulus, assumed that the Acari are monophyletic. Van der Hammen (1989) considered the Acari to be diphyletic, and the Acariformes and Parasitiformes at most distantly related. According to van der Hammen, the Ricinulei and Anactinotrichida (Parasitiformes + Opilioacariformes) are sister groups and, within another lineage, the Actinotrichida (Acariformes) and the non-acarine Palpigradi also are sister groups. Lindquist (1984) presented four derived characters linking the Acari and Ricinulei (his Table 9, p. 41) and concluded that, within the Acari proper, the Opilioacariformes and Parasitiformes form a sister group to the Acariformes. In our trunk page for the Acari, we follow the hypothesis of Lindquist (1984), which suggests that a monophyletic lineage includes the Ricinulei and the Acari. This hypothesis is based on the characters presented by Lindquist, and is in agreement with that of Weygoldt & Paulus (1979) and Schulz (1990), but not with that recently proposed by Dunlop (1996). Dunlop, J.A. 1996. Evidence for a sister group relationship between Ricinulei and Trigonotarbida. Bull. Brit. Arachnol. Soc. 10: 193-204. Evans, G.O. 1992. Principles of Acarology. CAB International, Cambridge. Johnston, D.E. 1982. Acari. In: Parker, S.P.(ed.) Synopsis and classification of living organisms. McGraw-Hill, New York, p. 111. Kethley, J.B., Norton, R.A., Bonamo, P.M. and Shear, W.A. 1979. A terrestrial alicorhagiid mite (Acari: Acariformes) from the Devonian of New York. Micropaleontology 35: 367-373. Krantz, G.W. 1978. A Manual of Acarology. 2nd Edition. Oregon State University Bookstores, Corvallis. Lindquist, E.E. 1984. Current theories on the evolution of major groups of Acari and on their relationships with other groups of Arachnida, with consequent implications for their classification. In: Acarology VI (Volume 1), D.A. Griffiths and C.E. Bowman (eds), John Wiley & Sons, New York, pp. 28-62. Norton, R.A., Bonamo, P.M., Grierson, J.D. and Shear, W.A. 1988. Oribatid mite fossils from a terrestrial Devonian deposit near Gilboa, New York. Journal of Paleontology 62: 259-269. Parker, S.P.(ed.) 1982. Synopsis and Classification of Living Organisms. McGraw-Hill, New York. Shultz, J.W. 1990. Evolutionary morphology and phylogeny of Arachnida. Cladistics, 6:1-38.
van der Hammen, L. 1989. An Introduction to Comparative Arachnology. SPB Academic Publishing, The Hague. Weygoldt, P. 1997. Evolution and systematics of the Chelicerata. In: Sabelis, M.W., Bruin, J., van der Geest, A. and Davids, C. (Eds), Proc. Third Symposium European Association of Acarologists, Amsterdam, July 1996. Exp. Appl. Acarol. (In press). Weygoldt, P. and Paulus, H.F. 1979. Untersuchungen zur Morphologie, Taxonomie und Phylogenie der Chelicerata. 2. Cladogramme und die Entfaltung der Chelicerata. Zeitschrift fur Zoologische Systematik und Evolutionforschung 17: 177-200. Mite Image Gallery. The University of Queensland. Acari. Mites and Ticks: A Virtual Introduction. USDA. Top: Scanning electron micrograph of microbe grazing oribatid mite. Page: Tree of Life Acari. The Mites. Authored by David Evans Walter, Gerald Krantz, and Evert Lindquist. The TEXT of this page is licensed under the Creative Commons Attribution-NonCommercial License - Version 3.0. Note that images and other media featured on this page are each governed by their own license, and they may or may not be available for reuse. Click on an image or a media link to access the media data window, which provides the relevant licensing information. For the general terms and conditions of ToL material reuse and redistribution, please see the Tree of Life Copyright Policies.